Remember a few months ago when I told you about the world's best chocolates? Well, the creative chocolate duo, Robert & Ashley (or"the chocolate people" as my girls like to call them) of Fleurir Hand Grown Chocolates have landed an awesome retail space in Georgetown, and they've brought me on to help transform it into the world's most fabulous chocolate shop!!! Working with them has been pure delight. I was already in love with them, but this has sealed the deal--they're awesome! It's a blast to be able to throw out wild ideas and have someone(s) really get it. They're creative visionaries, and it's wildly fun to be a part of it. It's the definitely the type of project that energizes rather than drains...which is why I have to force myself not to think about it too close to bed time or sleep won't happen. Ashley and Robert snagged the fantastic location after a few heartbreaks with other spaces that fell through, but this one is totally perfect. It's small and it's in pristine condition, which we needed because we have a total of three weeks (as in 1, 2, 3) to turn it into the sweet oasis that it's intended to become. Oh, and they're doing the work themselves. Impressive is an understatement. "Fleurir" (which I still can't pronounce despite asking them how to every time I see them) means to bloom, and the the shop's aesthetic is meant to build on that idea. 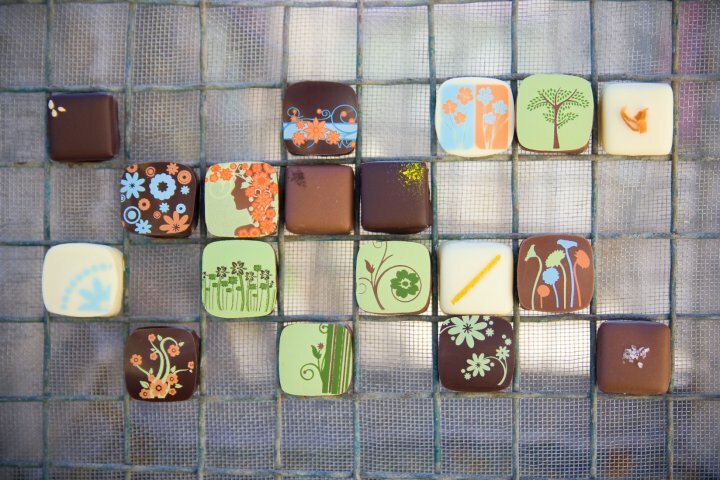 Like their chocolates, we want the shop to be a fresh interpretation of a rustic whimsical garden. In my mind, the above photo taken by the insanely talented Christina Bernales and styled by lovely Ashley served as the spring board for the design. And thankfully, my very talented sister and artist Nicole agreed to work her sculptural magic for the main installation. After showing her a quick sketch of what I had in mind and loosely describing my idea she had already come up with an incredible plan for a wall relief completely made out of found materials. She's pretty awesome. We're now entering the third week, and most of the work will be completed (fingers crossed) by the end of the weekend, so hopefully I'll have a few good pictures to share. In the meantime you can check out their blog for updates. I can't wait to see the shop and frankly taste those Chocolates. I actually tried to find their chocolates at a fine cheese shop in Old Town with no luck! Make sure you put your feet up every once in a while!!! What a fun project that must be. I'm assuming you get some chocolates along the way? I love working on projects that keep me up at night (in a good way). Can't wait to check back in next week and see what awesome things you've created. Designing a chocolate shop...really?! Some peeps get all the luck!! Wishing you luck and sleep for sure...can't wait to see how it all turns out! And looks like I have a fun chocolate store to walk to now...yay! Hey if you need anything vintage for the shop, just let me know and I can maybe find you something fun on Craigslist or at one of my favorite second hand shops...just a thought!